Our Online Galery with several photos of fishes and landscape. 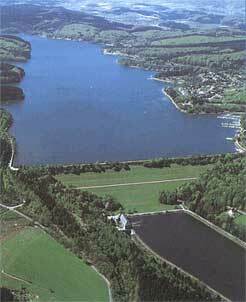 The area licence is an annual one and valid for the following lakes: Sorpe, Henne, Moehne, Bigge including Olper reservoir and Lister without drinking water protection area. There is only a limited number of area licences! Annual licenses are only valid until 31. of December. In order to get a fishing licence for the Sorpe you need a general German fishing licence. Residental fishermen have to pass an examination to get the German licence. Foreign fishermen (non-residentals) are able to buy it (16,- Euro per year) at the city hall of Sundern. There is a new regulation in our region: you have to show the fishing licence of your country to get the German one. In order to get the German licence you have to present your passport, the fishing licence of your country and a passport photo. It is possible to delegate the purchase of the German fishing licence to a different person who can do the job with presenting copies of your documents and the photo. Children aged less than 10 years are not allowed to fish in the German state NRW. Pike: 45cm / 15.02. - 30.04. Lake/Brown Trout: 50cm / 20.10. - 15.03. Char: 30cm / 20.10. - 15.03. Fishing Time: 1h before sunrise until 1h after sunset, nightfishing (only of the bank) is allowed from 1. June until 30. September except along the street at the small lake. Boat Fishing: Combustion engines are forbidden. Fishing by boat is forbidden at the upper small part from 15. February until 15. June. Prohibited Areas: There are only a few areas of the bank where you are not allowed to fish. (E.g. the dam of the reservoir, for details see map) You are not allowed to fish behind the bridge where the ferry lands from 16. June until 30. September. (For details see fishing licence!) Fishing at the summer spot for diving is forbidden from 1. April until 14. November. Protected areas for spawning: Fishing in protected areas for spawning is forbidden from 1. November until 15. June. Bans: Ice fishing, live baitfish, bond fire and irregular camping are forbidden! Tents and umbrella tents are forbidden along the street at the small lake. The reservoir was finished in 1935. It covers an area of about 330 ha, its volume is about 70 Mio. m³. The total length is about 7 km, its maximum width about 600m. The upper small part is up to 11m, the main lake up to 56m deep. Owner of the reservoir is RV (Ruhrverband). The Sorpe is looked after by professional fishermen of RV. Their only task is to control the balance of the fish stock in order to ensure attractive fishing conditions whilst considering the environmental and ecological conditions of the reservoir. The fish stock consist of the following species: Pike (over 15 kg), Zander (up to 10 kg), Perch (up to 2,5 kg), Lake Trout (over 10 kg), Brown and Rainbow Trout (up to 5 kg), Char (over 4 kg), Common Whitefish (up to 1,5 kg), Eel (up to 2,5kg), Chub, Carp (over 15kg), Tench (up to 3kg), Roach, Bream, Bleak, Gudgeon. The main target fishes are: Common Whitefish, Roach and Bream, Perch, Pike, Eel und Trout. In spring and summer we recommend to fish for Roach, Bream and Eel in the shallow upper parts of the reservoir. Pike and Perch can be found close to the bank in this time of the year as they are heading for spawning fish and have just spawned themselves there. The best time for Trout is just when the saison starts until about the beginning of May. You should especially fish in areas where water comes in. Shallowly presented artificial bait and worms are very promising. In summer there often is a thermocline in a depth of about 10m. Big Pikes often follow the schools of Common Whitefish into the middle of the reservoir. Open water spinning and trolling often is successful then. Especially trollingwith baitfish and float has been very successful recently. In summer also a lot of aquatic plants can be found close to the bank of the main lake. In these areas there are lots of hot spots for pike and perch then. In autumn and winter fish generally lives in deeper water. You should consider this and choose appropriate methods. Feeder fishing for example dominates float fishing then. In this time of the year jigging by boat for Perch, Zander and Pike also is very promising. Predator fishing from the bank only makes sense if you present your bait deeply then. In spring and early summer sometimes bank fishing for Common Whitefish is possible, especially in the upper area of the main Part of the Reservoir. Experts usually fish by boat for this species (sometimes in more than 30m depth). Sometimes not only them catch large amounts of these tasty fishes. Some recommended adresses are on our Linkpage. Fishermen, please keep the environment clean, it is worthwile!